China manufacturing and services are both in contraction at the fastest rate since early 2009. The Caixin China General Manufacturing PMI shows operating conditions deteriorate at fastest rate since March 2009. Chinese manufacturers saw the quickest deterioration in operating conditions for over six years in August, according to latest business survey data. Total new orders and new export business both declined at sharper rates than in July, and contributed to the most marked contraction of output since November 2011. Lower production requirements prompted companies to reduce their purchasing activity at the fastest rate since March 2009, while weaker client demand led to the first rise in stocks of finished goods in six months. Meanwhile, softer demand conditions contributed to marked falls in both input costs and output charges in August. The bad news in China does not stop with manufacturing. 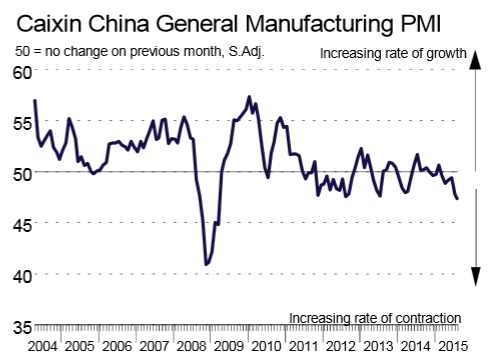 Markit reports the Caixin China General Services PMI has the fastest contraction of output seen since February 2009. By now it should be perfectly clear to everyone that the entire global economy is cooling and the US will not decouple from that slowdown. Nonetheless, most economists, including those at the Fed, still do not see the obvious.